Fabri-Quilt New Block Blog Hop! Introducing Poseidon's Hall! 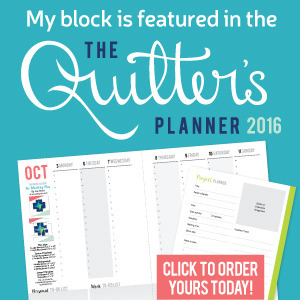 Welcome to Day Two of the 2015 Fabri-Quilt New Block Blog Hop! I am so excited to be part of this wonderful blog hop sponsored by Fabri-Quilt and Inspired by Fabric and hosted by Yvonne of Quilting Jetgirl, Cheryl of Meadow Mist Designs, Stephanie of Late Night Quilter, and Teri Ann of Childlike Fascination. Over 60 bloggers are designing a new quilt block using the same Fat Eighth (F8) bundle of Prairie Cloth Cotton solids from Fabri-Quilt. So in just 4 days you get to see more than 60 new designs. How cool is that?! Fabri-Quilt graciously provided all the bloggers with a F8 bundle of Prairie Cloth Cotton solids that was curated just for this blog hop. The bundle has six fabrics - Chartreuse, Turquoise, Coral, Aqua, Lapis Blue, and White. This bundle is being called "Watermelon Summer." I love watermelon and I love summer. So there you go! The only requirements for the blog hop were that the blocks must be 12 1/2" x 12 1/2" (unfinished) and that they had to use at least 3 of the 6 fabrics in the bundle. · Poseidon’s Hall is a 12” x 12" finished (12 ½” x 12 1/2" unfinished) quilt block. The block is made up of three units (Unit 1, Unit 2, and Unit 3). · This block is made using Half-Square-Triangles (HST’s) and squares. 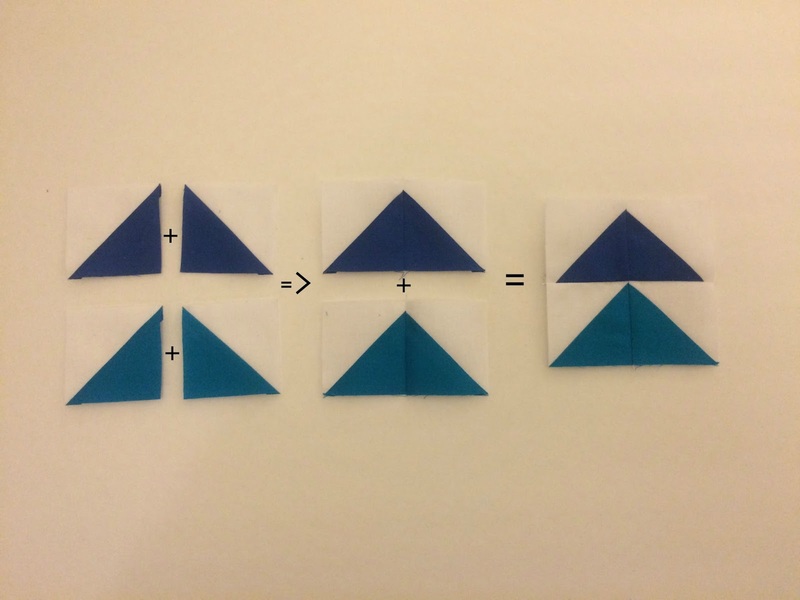 The pattern uses the “2 at a time” method for making the HST’s. · 1 – F8 (fat eighth) yard each, Fabri-Quilt Prairie Cloth Cotton Solid fabric in Lapis Blue, Chartreuse, Turquoise, Aqua, and White. · NOTE: A ruler with a 45° angle is needed for squaring up HST’s. Using a marking pen or pencil, draw a diagonal line on the wrong side of 12 white squares (3” x 3”). 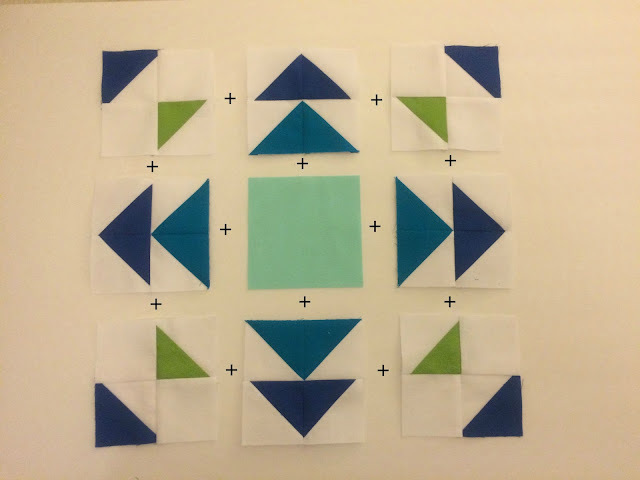 Pair a white square (3” x 3”) with each of the color squares (3” x 3”) right sides together for a total of 12 pairs. With the marked white square on top, sew ¼” away from the marked line on both sides. Tip: Chain piece the fabric pairs for fast assembly. Using scissors or a ruler and rotary cutter, cut the sewn pairs along the marked line and press the seams (either open or to the side) to reveal the HST block (24 total). Trim each HST block to 2 ½” x 2 ½”. Line up the 45° angle line on the ruler with the center line on the HST blocks to ensure accuracy when trimming. 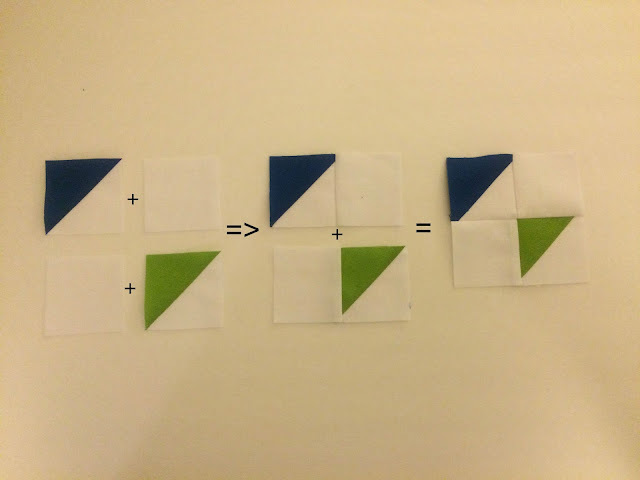 Using 2 white squares (2 ½” x 2 ½”), 1 Lapis Blue HST, and 1 Chartreuse HST, assemble Unit 1 according to the picture. Repeat 3 times for a total of 4 units. Using 2 Lapis Blue HST’s and 2 Turquoise HST’s, assemble Unit 2 according to the picture. Unit 3 is the Aqua square (4 ½” x 4 ½”). Nothing to do here. Hooray! Assemble the units as shown in the picture below. Square up the block to 12 ½” x 12 ½”. There you have it. One Poseidon’s Hall block. I really hope you enjoyed this tutorial. Don’t forget to check out all the other amazing blocks debuting this week. You can find them by clicking on the button link at the top of this post or by clicking on the host links below. Also, be sure to enter the giveaways! Fabri-Quilt will be giving away some half yard bundles of "Watermelon Summer." You can enter to win twice each day of the blog hop, once on the host of the day's blog and once on Inspired by Fabric. That's 8 chances to win! The giveaway is open through Friday, September 4th, at 11:59 pm (EST). Good Luck! Sometimes you see a pattern and you know exactly what fabric you want to use. Sometimes you just have a general idea. I know you know what I'm talking about. Last month I won a giveaway of the Sea Star pattern by Meadow Mist Designs. (Big thanks to The Carpenter's Daughter Who Quilts and Meadow Mist Designs!) 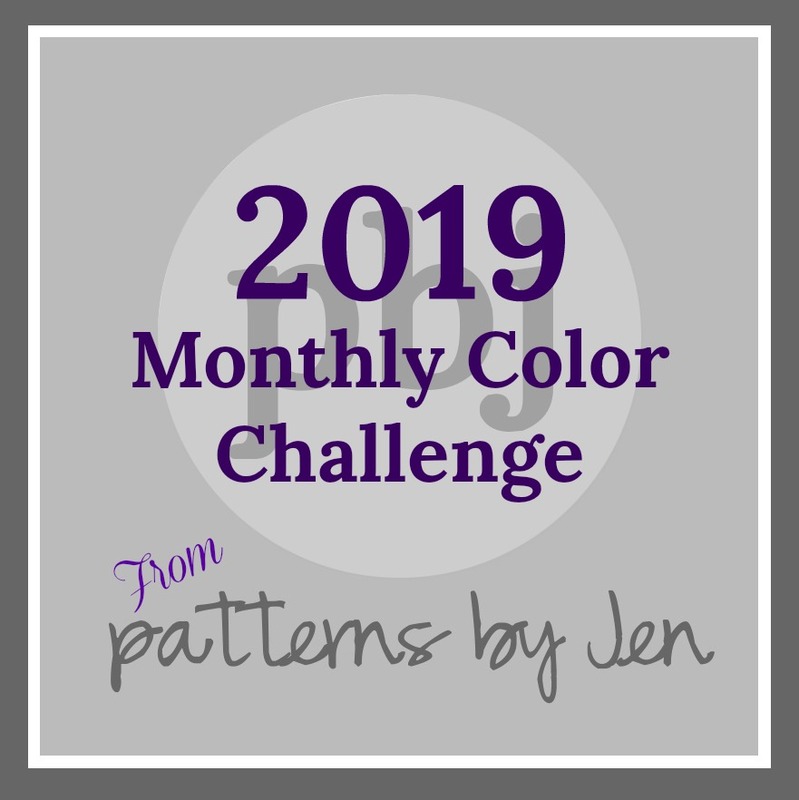 When I first saw the pattern I immediately thought of some purple-ish, watercolor-ish fabric I had seen a while back. I know, right? Great description of a fabric collection. Good luck finding it again. After a bit of searching I found this fabric. This collection is called Sunday Morning by Dear Stella. I have no idea if it's the fabric I originally saw a few months ago but it's EXACTLY what I wanted for the Sea Star pattern. This fabric is not in my general aesthetic. It's not anything I would usually pick out. But oh how I love it! 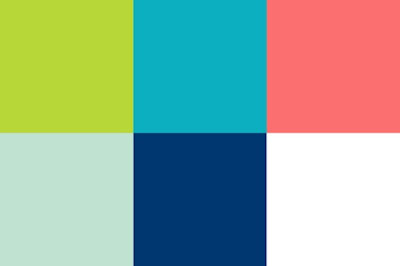 I've been doing a lot of rainbow-y, color-wheel stuff lately and I'm excited to work on something that isn't basically ROYGBIV. Don't get me wrong, I love a good rainbow and there are still few more uber-colorful projects on the way.